This week’s POTW is an obvious choice. Rickie Fowler finally broke through after two years on the PGA Tour, capturing his first victor at the Wells Fargo Championship at Quail Hollow, beating D.A. Points and Rory McIlroy on the first hole of the sudden-death playoff. I’ve been critical of Rickie in the past….particularly, https://thepowerfade.wordpress.com/2011/06/08/fail-of-the-week-4/. What’s worse, he’s taken his douchy-dressing to a new level. Can you say “child molester?” I threw up a little in my mouth when I saw the replay of the Saturday round with Jim Nance and Nick Faldo (wearing full suits and ties) interviewing the little punk dresser with his backward cap, molester stache, and bright yellow outfit. People keep saying “he’s great for the game.” And, while I wish he weren’t SO far to the bright colors and outlandish outfit side, I’m starting to come around. Dude has incredible game. Nothing he does is really over the top or completely polished, but he manages no to make big mistakes and he manages to put it together for great rounds and exciting golf. What’s more, the tournament yesterday was rivetting. Webb Simpson almost broke through, but came up just short. A 3-man playoff and Fowler nailed a 5-footer for birdie on a 460-yard par 4 to take home the trophy. Dare I say it? Is golf becoming exciting again? Even….without….Tiger? Even better, for the first time in a long time, a major champion is at the top of the World Golf Rankings: http://www.officialworldgolfranking.com/rankings/default.sps. And even Tiger Woods is now back in the top 10. LG and I often romanticize the idea that Tiger Woods will come back to make the game exciting again. But we’ve had several nailbiting tournaments this year, and they didn’t rest solely on Tiger’s performance (as the PGA Tour has for so many years). I’m starting to find myself following players that, previously, I had no interest in. If Fowler wants to dress like a d-bag, go ahead; the kid can play the game. 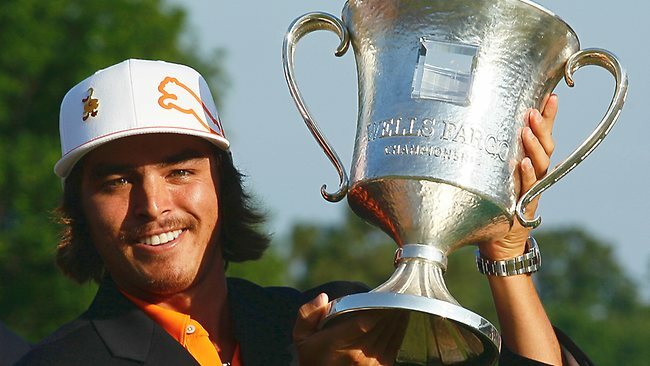 So, to you, Rickie Fowler, we salute you. Many congrats on breaking through for your first win, and thanks for helping keep the US in the winner’s circle. God that stache is horrid. ANSWERS IN BOLD – YIKES! This is probably our worst job yet. Thanks LG for helping us achieve a new low here at the PF. The Tiger Woods edition was fun but (thankfully) is now over. It’s time to load your predictions for this year’s final major. Did you hear the fairways at AAC are running 9 on the stimp! Unbelievable! The course is in tremendous shape and I’m looking forward to going out and seeing the best of the best. It’s hard to believe it’s already the time of year for the final major, but, alas, the golf season must end sometime. I’m looking forward to some September and October baseball, when my Braves crush LG’s Giants. However, first things first. Without further ado, our PGA predictions. Response from LG – I love the Braves as well, sir. My first professional team ever when I moved to Atlanta. Last year when my Giants had to crush the Braves during the playoffs, I was torn. Care to wager? RE re from JK – I’m not even sure the Giants will make the playoffs this year, but assuming they do–yes. Who is most likely to Dustin Johnson it? Phickelson Definitely Jason Dufner. Although Phickelson had his own little meltdown after a few birdies on the front side. Will Dustin Johnson do a line of coke off his driver face? Not while the cameras are on him i didn’t see it, but he wasn’t there on the weekend…so…. Will Tiger shave? I hope so. He looks like he dipped his chin in a bowl of poop sadly, no. he still looks evil. 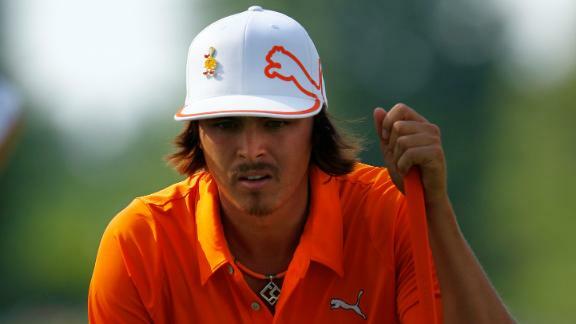 Will Rickie Fowler wear all orange on Sunday? I hope not. Atlanta has enough pollution. It doesn’t need nuclear radiation along with it. yes, and my eyes will never heal from the pain they experienced at seeing him live. I’m just waiting for that kid to paste a Home Depot logo on the back of that thing. Will LG be jealous of JK’s Sunday ticket to the PGA Championship? He already is =).CORRECT. I had a blast. 11 hours at a golf course, worth every ounce of pain I’ve endured this morning. “Unknown” in the Top 10: Kevin Na Na was in the Top 10 (T-10, -2), but once again LG picks an “unknown” that everyone knows. You picking Sergio Garcia for the Masters, LG? Will Tiger shave? I hope not. Beards rule! It’s okay, JK, not everyone is man enough to grow a beard. sadly, correct. Will LG be jealous of JK’s Sunday ticket to the PGA Championship? I Already am. I’ll hopefully be using a telecast of the PGA to get over jet lag on Sunday. Let’s hope for some red in contention so I can stay awake!